Last week, Stirling Council launched a mining heritage website , which features information held in Stirling Libraries and Archives, and the information boards from the Stirling Smith’s Polmaise exhibition of last year. The collection is always growing. A recent gift to the Smith is a rope-suspended wooden swing of the late 1930s made by Polmaise colliery craftsmen for five year old Jean Russell who lived in the blocks in Fallin. 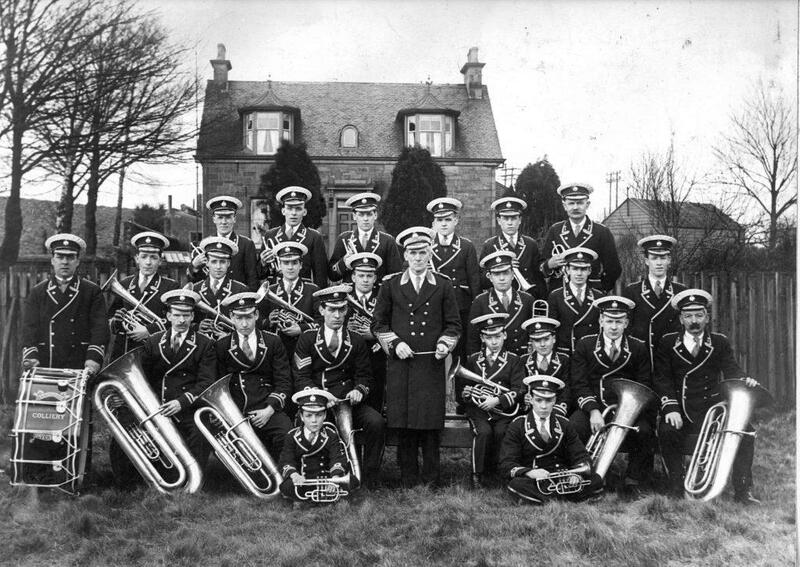 The photograph here shows the award-winning Bannockburn Colliery Silver Band in 1928, just after the purchase of their new uniforms, posing beside the mine manager’s house. The colliery, sunk as a deep mine in 1894, was in the village of Cowie where households shared washing facilities, and where there were no colliery baths until 1931. In spite of the brutally hard, dangerous and dirty work, the miners still managed to dress smartly, play good music and win prizes for it. In the centre with his baton is Conductor James Currie. His son, brothers and cousins – six Curries in total – were band members. His great granddaughter Jacqueline lives in Cowie, and runs the coffee shop at the Smith.